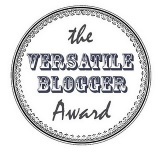 Few weeks back, my blog was nominated for “The Versatile Blogger Award” thanks to the gorgeous, stylish, much taller than me spiritual daughter: Ines Cherie. These type of chain awards, not only make the receiver feel good, but they lead to the exposure of other interesting content through your blog. Thank the blogger who gave it to you. Mention 7 random things about yourself. Award to 15 or more bloggers.